With Australia now having legislated to place a price on Carbon Dioxide emissions, the new talk is of of finding ways to replace those largest of all emitters, large scale coal fired power which produces 35 to 40% of all those man made CO2 emissions. Large scale Coal fired power has the distinct advantage of being able to supply huge amounts of power on a 24/7/365 basis, so to actually replace that, then you need to have a method of power generation that is actually able to do the same thing, supply that huge level of power on a 24/7/365 basis. Of the current renewable power plants in favour, Wind and Solar PV just cannot achieve this, and no matter how many of them they do construct, they will never be able to do what those large coal fired plants can do. Deliver constant reliable and large amounts of electrical power. We are told that the most attractive option here that might be able to do this on an equal basis is Concentrating Solar Power, also referred to as Solar Thermal Power. But is this true? Can Concentrating Solar deliver? While it is easy to say that, what is difficult is to explain why it cannot achieve this, and this is technical, and because of that, people, without understanding, will just accept the claim that Concentrating Solar CAN actually replace large scale coal fired power. There have been many advances in the technology of power generation, and one of these is the actual power that can be generated from just one large generator. These very large generators can in fact generate up to, and in some cases, beyond 1000MW, a huge amount of power. If that is the case, then why not just install of of these generators at a Concentrating Solar power plant. Again, the answer is technical, and needs careful explanation. Generators of this size will typically weigh up around 1500 tons. A generator is a rotating piece of equipment. Now that whole 1500 tons does not rotate. Inside the generator is a huge rotating magnetic field and this is the Rotor. This field is made with vast lengths of wire wound around a magnetic field material former, and these are your typical huge electromagnets. Different materials make for much larger magnetic fields. More wiring wrapped around them make even larger fields, and these fields can be even larger if the whole rotor is kept in a supercooled environment, and these large generators in fact have the rotor in a supercooled environment. Because of all this, the rotor, the part that actually spins at that speed, is immensely heavy, and in some cases this can be up around 400 to 600 tons, and some even heavier than that. This rotor spins, and it has to be driven at that constant speed to generate the power required. To drive this Rotor, an immense turbine is needed, and typically, these are three stage turbines. They are similar in nature to jet aircraft turbines, and again be aware that I have mentioned similar, because while they have many rows of many blades of differing lengths in a similar fashion to jet turbines, these multi stage turbines driving the generator are way way larger than any jet turbine on an aircraft. So now, we have a turbine driving the generator. Something has to actually make that turbine rotate itself, and here, think of the small alternator in your car, where a small belt attached to the engine drives the alternator, hence the engine of the car makes the belt rotate driving the alternator. In the case of a large scale power plant generator, what drives this turbine is steam. Immense amounts of high pressure, high temperature steam. With coal fired power, this steam is made in a huge boiler that is heated by a huge critical furnace which burns immense amounts of crushed coal in powder form and forced into the furnace and then burned at huge temperatures to boil the water to steam to drive the turbine to drive the rotor which rotates at that 3000RPM, inducing power into the wires in the Stator which is wrapped around the rotor, this Stator producing the vast amounts of power. With large scale Nuclear Power, this immense amount of steam is made in one of two ways. Either with an older technology BWR, (Boiling Water Reactor) where the nuclear reaction of the fuel rods boils the water directly to drive the turbine, or more recent technology PWR, (Pressurised Water Reactor) where the boiling water in the reactor itself is used to make high temperature high pressure steam in a second vessel. Nearly all of these current nuclear plants have two generator complexes on site, and each plant generates around 2000MW plus, so each of those generators can generate 1000MW, and some are even up around 1200MW. So then, let’s look at the process that Concentrating Solar Power uses to generate its power. With this form of power generation, it is actually similar to a conventional steam plant like coal fired or Nuclear. The generator is driven by a turbine which is driven by steam, only in the case of Concentrating solar power the ‘heat source’ is a molten salts compound used to make the steam. Mirrors are used to focus sunlight onto this compound to heat it to that molten state. This can be achieved by focusing all the mirrors onto a central pint where the compound is. This is the Power Tower method, using mirrors that track the Sun during the day (these called heliostats) focusing the light onto a large tower. A second version the Solar Trough method passes the compound through a pipe at the focal point of curved mirrors laying almost flat, and these also track the Sun during the day. These Concentrating solar plants can use that compound as it is heated to directly make steam, ending in the generation of the power. Or, some of the compound can be kept at that molten state for longer periods of time so it can be used for periods of time after the Sun has set. This method is referred to as ‘Heat storage’. It can be seen best at the following diagram, which looks complex. However the thing most of note here is that dark orange line close to the bottom of the chart. Note how it indicates the power output from a plant of this nature with heat diversion. That total power is 50MW and is generated from around 8AM until 3AM, and keep in mind that this is theoretical, as the year round average is closer to 15 hours. This is the standard diagram for CS power plant theory. These types of plant are more expensive than just the straight out Concentrating solar plants that have no heat storage, in fact more expensive by a factor of around one third. These plants also have a shorter life span, and in fact, the best case scenario is that they can last for 25 years. So far, Concentrating Solar plants can generate around 250MW at best. However with heat storage that total output drops dramatically to around only 50MW in total, as indicated in the diagram. 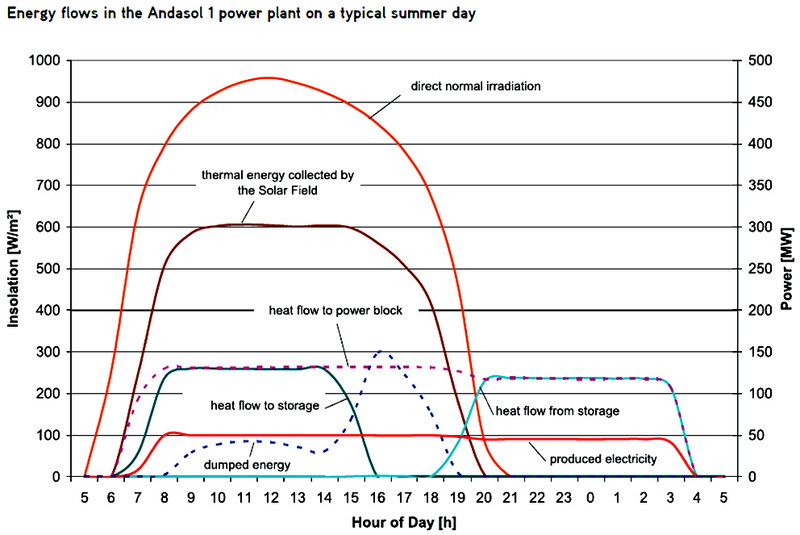 While plants without heat storage can generate their full power for only around a maximum of 5 to 6 hours a day, averaged across the whole year, those with heat storage can generate their power for up to a year round average of 15 hours. However, this hourly figure is still somewhat theoretical in nature. Some smaller plants, one of them in Spain has actually generated power for a full 24 hour period, in Mid Summer on a hot cloud free day, but keep in mind here that this was only a small amount of power, only 17MW in fact. So, the question I asked earlier still stands. Why not just connect one of these huge 1000MW generators at a Concentrating Solar Power Plant? The problem here is the steam needed to drive the turbine. Remember I mentioned the weight of the rotor, 400 to 600 tons or more. A Concentrating solar plant could never generate the steam required to even begin to turn that huge weight over, let alone get it up to 3000RPM and hold it at that speed constantly. A large generator like that would just sit there and not move, ever. So far, the theoretical best for a Concentrating solar (CS) plant is in fact 50MW of power, indicating that they have considerably smaller generators with much lighter rotors, hence much less power gets generated. Those CS plants will typically have around five of these 50MW generators, and the average output is around 250MW for a really large (in area) CS plant, so that means 5 of those small turbine generator complexes, and they will produce their 250MW of power for around that time of 5 to 6 hours, more on hot cloud free Summer days. Without heat diversion, all 5 generators are running. However, with heat diversion, only one generator will be running, and running for as long as they can make steam enough to drive the turbine at the required speed, and keep it there. So, all right then, can we compare this CS plant with the one of another type? I’ll use a large scale Nuclear power plant here, and keep in mind that this is just an exercise for the sake of comparison, because Nuclear power is not an option for Australia, and will probably not be for at least 20 years, and probably even longer. We could use a large scale coal fired plant of the same power output, but, hey, the whole object of moving to renewables is to replace those CO2 emitting plants. Let’s then construct just the one large scale Nuclear plant. It will have 2 reactors, each driving one turbine Generator complex, and will have a total power output of, and let’s keep it round, say 2000MW. These plants are enormously expensive, (so we are told) so hear I’ll use figures of those who oppose Nuclear power, and say a plant of this nature will cost around $12 BILLION. Now, see immediately how much out of the question a plant like that is, just on cost alone. It’s just way too expensive, the usual argument from those who are against Nuclear power generation. But hey, let’s even make it worse still. Let’s double that figure and then round it off to say ….. $25 BILLION. (now it is out of the question. This is just ONE plant remember. A plant of this nature will be operational for 50 years, and can even be extended out to 60 and even to 70+ years. A plant of this nature will run constantly all the time, barring down time (for reactor fuel rod refulling, one reactor at a time, around every 18 Months or so) and has an enormously high rate for the delivery of its power, referred to as the Capacity Factor (CF). Currently in the U.S. the whole fleet of of 102 Nuclear Reactors at power plants are running at a yearly CF average of 92.5% and in Summer, that is up around 95%. 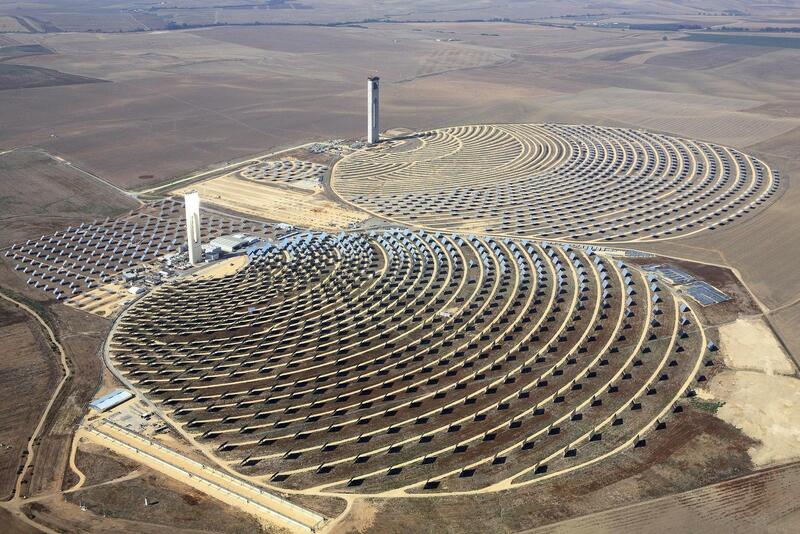 This image shows one type of Concentrating Solar Power Plant, in this case the Power Tower plant type. If you click on the image, it will open in a new and larger window. So now, lets see if we can get the same amount of power from CS Power Plants with heat diversion, because this, we are told is the best option for replacing large scale coal fired power, and keep in mind here the exercise here is a comparison with Nuclear power. Now one large scale CS plant with heat diversion will cost in the Vicinity of $1.4 Billion, but hey, I’m often accused of inflating data to suit my own purpose so let’s say that CS will actually get cheaper if we build more of them, (incidentally something which is not happening) so let’s drop that price to just $1 Billion. So we’ve doubled the cost of the Nuke, and lowered the cost of the CS plant by 40%. So now, to make the same power as that large Nuke, we will need (2000MW divided by 50MW) or 40 of these plants. That’s 40 CS plants now to seemingly generate the same power. Remember I said that the Nuke has an actual power delivery CF of 92.5%, Well these CS plants only generate their power for 15 hours a day on a year round average with heat diversion, so that means they have a CF of 62.5%. That’s theoretical, and when I’ve mentioned it in other fora, I’ve been flamed saying that CF really is around 66%. So hey, Let’s use their own figures. To produce the same power as the one nuke we now need to do that on a comparison rate of that CF of 66% compared to the Nuke of 92.5%, so now we will need more of those CS plants. The new total is 56 of these CS plants. But wait, remember I mentioned that these CS plants only have a dedicated life of 25 years. The Nuke has an initial life span of 50 years, and hey, let’s go with that base age. So now, to produce the same power for consumption as that one Nuke, we need to double the number. So now we have 112 of these CS Plants. So now, instead of finding ONE area to site ONE Nuke, and do all the admin, all the studies, all the impact statements, find the funding, and then construct the plant, we need to do that 112 times over. You cannot even imagine the time all of that would take. In the whole life of that ONE Nuke, they would never construct that number of plants, let alone start off on an equal footing. See now how stupid the whole exercise has become. The cost, at the reduced base cost of $1 Billion each is now $112 BILLION. 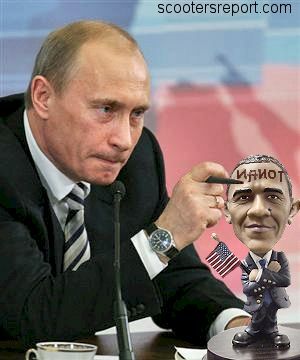 The one Nuke, at double the cost is $25 Billion. Now that we are aware of the facts, let’s have this honest debate. Well, that too is out of the question. Nuclear Power is not even the vaguest of thoughts here in Australia. And you may say why was not the exercise done for coal fired power. Well, coal fired power is also off the table here in Australia, so why even do the exercise at all. Similar results would be the result for a comparison with coal fired power. Proponents of CS will come in and say that coal fired power can be an option provided it includes CCS, a phantom that will never be realised no matter what the cost, and how the technology develops. In the interim, proponents of renewable power use the Bogus LCOE charts for cost comparison, charts that are so wildly biassed against anything not of a renewable flavour, and including worst case scenarios for non renewables, and best case scenarios for renewables. This is another of those debates that will never take place. We will have Concentrating Solar Power thrust on us without even considering that it is one of the single worst options that there could be in place. At every step of the way, Concentrating Solar fails at each of those steps. This is not the answer, and in fact, if it is the answer, then someone is asking the wrong question. All this for exactly the same amount of electrical power for consumers. Now can you gain an idea how any move to renewable power will drive up the cost of electricity for all consumers, and not JUST drive it up, but drive it up by a very considerable amount. These people who construct these types of plant do not do it out of an altruistic nature. They have to see a return for their investment, and they also have to see that there is profit in it. Otherwise, they will not even commit to it in the first place. Concentrating Solar power will fail, because it cannot do what is claimed, replace coal fired power. Just one of the factors missing from you calculations is cost of fuel. Nuclear and coal facilities will have much higher operational costs due to cost of fuel. Your argument is valid as stated, CS replacing a 1000MW coal fired plant, and is ludicrous. Many areas do not require that level of production and a more appropriate comparison would be cost of ownership over the life of each method of generation. Thanks for the pointer to your series! I’m going through it now, and will link to it from my own site. Great stuff! Thank you for leaving a comment, as it’s always good to get any sort of feedback. Most of the near 900 Posts I have at our site detail electrical power generation of every type, and it is a great pity that while Australia does have such a large proportion of the World’s Uranium that could be used as Nuclear power plant fuel, we have no Nuclear power plants, and none are even close in the foreseeable future, probably for at least 20 years and even longer. Most of my Posts detail the futility of a reliance upon the renewable power plants that are currently ‘flavour of the month’, Wind and the versions of Solar power. Nowhere is there real truth about these renewables and how they fail to deliver power that is required absolutely. I have a series on Nuclear Power at the top of our Home Page that discusses every aspect of Nuclear Power, and what surprises me is how uninformed people really are about nuclear electrical power generation. Great job. Much the same capacity-factor argument can be made for wind power. By the time all is said and done, the wind farm has a bigger environmental footprint than a nuclear plant for the same actual power produced (not nameplate capacity). Nevertheless, the people like you who know something about the subject must be willing to keep making the effort to educate the public. Consider this a tip of the hat in your general direction. Australia has much of the world’s uranium reserves (if you haven’t sold them all to the Chinese yet). It’s lunacy that you’re unwilling to use them yourselves.